Spirulina is a biomass of cyanobacteria (blue-green algae) that can be consumed by humans and other animals. The two species are Arthrospira platensis and A. maxima. Cultivated worldwide, Arthrospira is used as a dietary supplement or whole food. It is also used as a feed supplement in the aquaculture, aquarium, and poultry industries. The species A. maxima and A. platensis were once classified in the genus Spirulina. The common name, spirulina, refers to the dried biomass of A. platensis, which belongs to photosynthetic bacteria that cover the groups Cyanobacteria and Prochlorophyta. Scientifically, a distinction exists between spirulina and the genus Arthrospira. Species of Arthrospira have been isolated from alkaline brackish and saline waters in tropical and subtropical regions. Among the various species included in the genus Arthrospira, A. platensis is the most widely distributed and is mainly found in Africa, but also in Asia. A. maxima is believed to be found in California and Mexico. The term spirulina remains in use for historical reasons. Arthrospira species are free-floating, filamentous cyanobacteria characterized by cylindrical, multicellular trichomes in an open left-handed helix. They occur naturally in tropical and subtropical lakes with high pH and high concentrations of carbonate and bicarbonate. A. platensis occurs in Africa, Asia, and South America, whereas A. maxima is confined to Central America. Most cultivated spirulina is produced in open-channel raceway ponds, with paddle wheels used to agitate the water. Spirulina was a food source for the Aztecs and other Mesoamericans until the 16th century; the harvest from Lake Texcoco in Mexico and subsequent sale as cakes were described by one of Cortés' soldiers. The Aztecs called it "tecuitlatl". Spirulina was found in abundance at Lake Texcoco by French researchers in the 1960s, but no reference to its use was made by the Aztecs as a daily food source after the 16th century, probably due to the draining of the surrounding lakes for agriculture and urban development. The topic of the Tecuitlalt, which was earlier discovered in 1520, was not mentioned again until 1940, the French phycologist Pierre Dangeard mentioned about a cake called “dihe”, consumed by Kanembu tribe, who harvest it from Lake Chad in the African nation of Chad. Dangeard studied the dihe samples and found it to be a dried puree of the spring form of the blue-green algae from the lake. The dihe is used to make broths for meals, and also sold in markets. The spirulina is harvested from small lakes and ponds around Lake Chad. During 1964 and 1965, the botanist Jean Leonard confirmed that dihe is made up of spirulina, and later studied a bloom of algae in a sodium hydroxide production facility. As a result, the first systematic and detailed study of the growth requirements and physiology of spirulina was performed as a basis for establishing large-scale production in the 1970s. As an ecologically sound, nutrient-rich, dietary supplement, spirulina is being investigated to address food security and malnutrition, and as dietary support in long-term space flight or Mars missions. Its advantage for food security is that it needs less land and water than livestock to produce protein and energy. Dried spirulina contains 5% water, 24% carbohydrates, 8% fat, and about 60% (51–71%) protein (table). Provided in its typical supplement form as a dried powder, a 100-g amount of spirulina supplies 290 Calories and is a rich source (20% or more of the Daily Value, DV) of numerous essential nutrients, particularly protein, B vitamins (thiamin and riboflavin, 207% and 306% DV, respectively), and dietary minerals, such as iron (219% DV) and manganese (90% DV) (table). The lipid content of spirulina is 8% by weight (table) providing the fatty acids, gamma-linolenic acid, alpha-linolenic acid, linoleic acid, stearidonic acid, eicosapentaenoic acid (EPA), docosahexaenoic acid (DHA), and arachidonic acid. In contrast to those 2003 estimates (of DHA and EPA each at 2 to 3% of total fatty acids), 2015 research indicated that spirulina products "contained no detectable omega-3 fatty acids" (less than 0.1%, including DHA and EPA). An in vitro study reported that different strains of microalgae produced DHA and EPA in substantial amounts. Spirulina does not contain vitamin B12 naturally (see table), and spirulina supplements are not considered to be a reliable source of vitamin B12, as they contain predominantly pseudovitamin B12 (Coα-[α-(7-adenyl)]-Coβ-cyanocobamide), which is biologically inactive in humans. In a 2009 position paper on vegetarian diets, the American Dietetic Association stated that spirulina is not a reliable source of active vitamin B12. 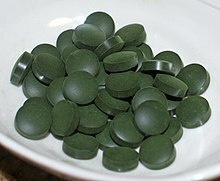 The medical literature similarly advises that spirulina is unsuitable as a source of B12. Spirulina may have adverse interactions when taken with prescription drugs, particularly those affecting the immune system and blood clotting. Spirulina is a form of cyanobacterium, some of which are known to produce toxins such as microcystins, BMAA, and others. Some spirulina supplements have been found to be contaminated with microcystins, albeit at levels below the limit set by the Oregon Health Department. Microcystins can cause gastrointestinal disturbances, and in the long term, liver damage. The effects of chronic exposure to even very low levels of microcystins are of concern, because of the potential risk of toxicity to several organ systems and possibly cancer. These toxic compounds are not produced by spirulina itself, but may occur as a result of contamination of spirulina batches with other toxin-producing blue-green algae. Because spirulina is considered a dietary supplement in the U.S., no active, industry-wide regulation of its production occurs and no enforced safety standards exist for its production or purity. The U.S. National Institutes of Health describes spirulina supplements as "possibly safe", provided they are free of microcystin contamination, but "likely unsafe" (especially for children) if contaminated. Given the lack of regulatory standards in the U.S., some public-health researchers have raised the concern that consumers cannot be certain that spirulina and other blue-green algae supplements are free of contamination. Heavy-metal contamination of spirulina supplements has also raised concern. The Chinese State Food and Drug Administration reported that lead, mercury, and arsenic contamination was widespread in spirulina supplements marketed in China. One study reported the presence of lead up to 5.1 ppm in a sample from a commercial supplement. Spirulina doses of 10 to 19 grams per day over several months have been used safely. Adverse effects may include nausea, diarrhea, fatigue, or headache. Like all protein-rich foods, spirulina contains the essential amino acid phenylalanine (2.6-4.1 g/100 g), which should be avoided by people who have phenylketonuria, a rare genetic disorder that prevents the body from metabolizing phenylalanine, which then builds up in the brain, causing damage. Spirulina contaminated with microcystins has various potential toxicity, especially to children, including liver damage, shock and death. Various studies on spirulina as an alternative feed for animal and aquaculture were done. Spirulina can be fed up to 10% for poultry  and less than 4% for quail. Increase in the spirulina content up to 40g/kg for 16 days in 21-day-old broiler male chicks, resulted in yellow and red coloration of flesh and this may be due to the accumulation of the yellow pigment, zeaxanthin. Pigs and rabbits can receive up to 10% of the feed and increase in the spirulina content in cattle resulted in increase in milk yield and weight. Spirulina as an alternative feedstock and immune booster for big-mouth buffalo, milk fish, cultured striped jack, carp, red sea bream, tilapia, catfish, yellow tail, zebrafish, shrimp, and abalone was established and up to 2% spirulina per day in aquaculture feed can be safely recommended. According to the U.S. National Institutes of Health, scientific evidence is insufficient to recommend spirulina supplementation for any human condition, and more research is needed to clarify whether consumption yields any benefits. Administration of spirulina has been investigated as a way to control glucose in people with diabetes, but the European Food Safety Authority rejected those claims in 2013. Spirulina has been studied as a potential nutritional supplement for adults and children affected by HIV, but there was no conclusive effect on risk of death, body weight, or immune response. In 1974, the World Health Organization described spirulina as "an interesting food or super food" for multiple reasons, rich in iron and protein, and is able to be administered to children without any risk," considering it "a very suitable food." The United Nations established the Intergovernmental Institution for the use of Micro-algae Spirulina Against Malnutrition in 2003. In the late 1980s and early 90s, both NASA (CELSS) and the European Space Agency (MELiSSA) proposed spirulina as one of the primary foods to be cultivated during long-term space missions. Wikimedia Commons has media related to Spirulina. ^ a b c d e f g h i "Blue-green algae". MedlinePlus, National Library of Medicine, US National Institutes of Health. 1 November 2017. Retrieved 11 March 2018. ^ a b c d Vonshak, A. (ed.). Spirulina platensis (Arthrospira): Physiology, Cell-biology and Biotechnology. London: Taylor & Francis, 1997. ^ Gershwin, ME; Belay, A (2007). Spirulina in human nutrition and health. CRC Press, USA. ^ a b c d e Habib, M. Ahsan B.; Parvin, Mashuda; Huntington, Tim C.; Hasan, Mohammad R. (2008). "A Review on Culture, Production and Use of Spirulina as Food dor Humans and Feeds for Domestic Animals and Fish" (PDF). Food and Agriculture Organization of The United Nations. Retrieved November 20, 2011. ^ Diaz Del Castillo, B. The Discovery and Conquest of Mexico, 1517–1521. London: Routledge, 1928, p. 300. ^ Osborne, Ken; Kahn, Charles N. (2005). World History: Societies of the Past. Winnipeg: Portage & Main Press. ISBN 978-1-55379-045-7. ^ Abdulqader, G.; Barsanti, L.; Tredici, M. (2000). "Harvest of Arthrospira platensis from Lake Kossorom (Chad) and its household usage among the Kanembu". Journal of Applied Phycology. 12 (3/5): 493–498. doi:10.1023/A:1008177925799. ^ a b Riley, Tess (12 September 2014). "Spirulina: a luxury health food and a panacea for malnutrition". The Guardian, London, UK. Retrieved 22 May 2017. ^ "Ready for dinner on Mars?". European Space Agency. 13 June 2005. Retrieved 22 May 2017. ^ Khan, Z; Bhadouria, P; Bisen, PS (October 2005). "Nutritional and therapeutic potential of Spirulina". Current Pharmaceutical Biotechnology. 6 (5): 373–9. doi:10.2174/138920105774370607. PMID 16248810. ^ Campanella, L; Russo, MV; Avino, P (April 2002). "Free and total amino acid composition in blue-green algae". Annali di Chimica. 92 (4): 343–52. PMID 12073880. ^ Colla, LM; Bertolin, TE; Costa, JA (2003). "Fatty acids profile of Spirulina platensis grown under different temperatures and nitrogen concentrations". Zeitschrift für Naturforschung C. 59 (1–2): 55–9. doi:10.1515/znc-2004-1-212. PMID 15018053. ^ Golmakani, Mohammad-Taghi; Rezaei, Karamatollah; Mazidi, Sara; Razavi, Seyyed Hadi (March 2012). "γ-Linolenic acid production by Arthrospira platensis using different carbon sources". European Journal of Lipid Science and Technology. 114 (3): 306–314. doi:10.1002/ejlt.201100264. ^ Jubie, S; Ramesh, PN; Dhanabal, P; Kalirajan, R; Muruganantham, N; Antony, AS (August 2012). "Synthesis, antidepressant and antimicrobial activities of some novel stearic acid analogues". European Journal of Medicinal Chemistry. 54: 931–5. doi:10.1016/j.ejmech.2012.06.025. PMID 22770606. ^ Tokusoglu, O.; Unal, M.K. (2003). "Biomass Nutrient Profiles of Three Microalgae: Spirulina platensis, Chlorella vulgaris, and Isochrisis galbana". Journal of Food Science. 68 (4): 2003. doi:10.1111/j.1365-2621.2003.tb09615.x. ^ a b Watanabe, F (2007). "Vitamin B12 sources and bioavailability". Exp. Biol. Med. (Maywood). 232 (10): 1266–74. doi:10.3181/0703-MR-67. PMID 17959839. Most of the edible blue-green algae (cyanobacteria) used for human supplements predominantly contain pseudovitamin B(12), which is inactive in humans. The edible cyanobacteria are not suitable for use as vitamin B(12) sources, especially in vegans. ^ a b Craig, WJ; Mangels, AR (2009). "Position of the American Dietetic Association: Vegetarian diets". Journal of the American Dietetic Association. 109 (7): 1266–82. doi:10.1016/j.jada.2009.05.027. PMID 19562864. ^ Watanabe, F; Katsura, H; Takenaka, S; et al. (1999). "Pseudovitamin B(12) is the predominant cobamide of an algal health food, spirulina tablets". Journal of Agricultural and Food Chemistry. 47 (11): 4736–41. doi:10.1021/jf990541b. PMID 10552882. The results presented here strongly suggest that spirulina tablet algal health food is not suitable for use as a B12 source, especially in vegetarians. ^ a b c d Gilroy, D.; Kauffman, K.; Hall, D.; et al. (2000). "Assessing potential health risks from microcystin toxins in blue-green algae dietary supplements". Environmental Health Perspectives. 108 (5): 435–439. doi:10.2307/3454384. JSTOR 3454384. PMC 1638057. PMID 10811570. ^ Belay, Amha (2008). Spirulina (Arthrospira): Production and Quality Assurance. Spirulina in Human Nutrition and Health, CRC Press. pp. 1–25. ISBN 9781420052572. ^ "China's drug agency rejects state media claims of cover-up in lead found in health supplement". Washington Post. April 10, 2012. Retrieved April 23, 2012. ^ Robb-Nicholson, C. (2006). "By the way, doctor". Harvard Women's Health Watch. 8. ^ Ross, Ernest; Dominy, Warren (1990). "The nutritional value of dehydrated, blue-green algae (spirulina plantensis) for poultry". Poultry Science. 69 (5): 794–800. doi:10.3382/ps.0690794. PMID 2114613. ^ Ross, E.; Puapong, D. P.; Cepeda, F. P.; Patterson, P. H. (1994). "Comparison of freeze-dried and extruded Spirulina platensis as yolk pigmenting agents". Poultry Science. 73 (8): 1282–9. doi:10.3382/ps.0731282. PMID 7971672. ^ Toyomizu, M; Sato, K.; Taroda, H.; Kato, T.; Akiba, Y. (2001). "Effects of dietary Spirulina on meat colour in muscle of broiler chickens". British Poultry Science. 42 (2): 197–202. doi:10.1080/00071660120048447. PMID 11421328. ^ Nedeva, R.; Jordanova, G.; Kistanova, E.; Shumkov, K.; Georgiev, B.; Abadgieva, D.; Kacheva, D.; Shimkus, A.; Shimkine, A. (2014). "Effect of the addition of Spirulina platensis on the productivity and some blood parameters on growing pigs" (PDF). Bulgarian Journal of Agricultural Science. Retrieved February 20, 2016. ^ Peiretti, P. G.; Meineri, G. (2008). "Effects of diets with increasing levels of Spirulina platensis on the performance and apparent digestibility in growing rabbits". Livestock Science. 118 (1): 173–177. doi:10.1016/j.livsci.2008.04.017. Retrieved February 20, 2016. ^ a b Stanley, Jon G.; Jones, Jack B. (1976). "Feeding algae to fish". Aquaculture. 7 (3): 219–223. doi:10.1016/0044-8486(76)90140-X. ^ Kulpys, J.; Paulauskas, E.; Pilipavičius, V.; Stankevičius, R. (2009). "Influence of cyanobacteria Arthrospira (Spirulina) platensis biomass additive towards the body condition of lactation cows and biochemical milk indexes". Agron. Res. 7: 823–835. ^ Heidarpour, Aram; Fourouzandeh-Shahraki, Amir-Davar; Eghbalsaied, Shahin (2011). "Effects of Spirulina platensis on performance, digestibility and serum biochemical parameters of Holstein calves". African Journal of Agricultural Research. 6 (22): 5061–5065. ^ Santiago, Corazon B.; Pantastico, Julia B.; Baldia, Susana F.; Reyes, Ofelia S. (April 1989). "Milkfish (Chanos chanos) fingerling production in freshwater ponds with the use of natural and artificial feeds". Aquaculture. 77 (4): 307–318. doi:10.1016/0044-8486(89)90215-9. ^ Shigeru, Okada; Wen-Liang Liao; Tetsu Mori; et al. (1991). "Pigmentation of Cultured Striped Jack Reared on Diets Supplemented with the Blue-Green Alga Spirulina maxima". Nippon Suisan Gakkaishi. 57 (7): 1403–1406. doi:10.2331/suisan.57.1403. ^ Ayyappan, S. (1992). "Potential of Spirulina as a feed supplement for carp fry". In Seshadri, C. V.; Jeeji Bai, N. (eds.). Spirulina Ecology, Taxonomy, Technology, and Applications. National Symposium, Murugappa Chettiar Research Centre. pp. 171–172. ^ Ramakrishnan, C. Muthu; Haniffa, M. A.; Manohar, M.; et al. (2008). "Effects of probiotics and spirulina on survival and growth of juvenile common carp (Cyprinus carpio)" (PDF). The Israeli Journal of Aquaculture – Bamidgeh. 60 (2): 128–133. hdl:10524/19247. ^ Mustafa, Md. G.; Umino, T.; Nakagawa, H. (1994). "The effect of Spirulina feeding on muscle protein deposition in red sea bream, Pagrus major". Journal of Applied Ichthyology. 10 (2–3): 141–145. doi:10.1111/j.1439-0426.1994.tb00153.x. ^ Olvera‐Novoa, M. A.; Dominguez‐Cen, L. J.; Olivera‐Castillo, L.; Martínez‐Palacios, Carlos A. (1998). "Effect of the use of the microalga Spirulina maxima as fish meal replacement in diets for tilapia, Oreochromis mossambicus (Peters), fry". Aquaculture Research. 29 (10): 709–715. doi:10.1046/j.1365-2109.1998.29100709.x. ^ Ali, Md. Shawkat (2014). "Evaluation of the effects of feed attractants (Spirulina and ekangi) on growth performance, feed utilization and body composition of fingerlings of stinging catfish Heteropneustes fossilis". ^ Güroy, B, Şahin İ, Mantoğlu S, Kayalı S (2012). "Spirulina as a natural carotenoid source on growth, pigmentation and reproductive performance of yellow tail cichlid Pseudotropheus acei". Aquaculture International. 20 (5): 869–878. doi:10.1007/s10499-012-9512-x. ^ Geffroy, Benjamin; Simon, Olivier (2013). "Effects of a Spirulina platensis-based diet on zebrafish female reproductive performance and larval survival rate" (PDF). Cybium. 37 (1–2): 31–38. ^ Cuzon, Gérard; Santos, Rossana Dos; Hew, Meng; Poullaouec, Gilles (1981). "Use of Spirulina in Shrimp (Penaeus japonicus) diet". J World Mariculture Society. 12 (2): 282–291. doi:10.1111/j.1749-7345.1981.tb00302.x. ^ Tayag, Carina Miranda; Lin, Yong-Chin; Li, Chang-Che; Liou, Chyng-Hwa; Chen, Jiann-Chu (2010). "Administration of the hot-water extract of Spirulina platensis enhanced the immune response of white shrimp Litopenaeus vannamei and its resistance against Vibrio alginolyticus". Fish & Shellfish Immunology. 28 (5): 764–773. doi:10.1016/j.fsi.2010.01.023. PMID 20139007. ^ Britz, Peter J. (1996). "The suitability of selected protein sources for inclusion in formulated diets for the South African abalone, Haliotis midae". Aquaculture. 140 (1): 63–73. doi:10.1016/0044-8486(95)01197-8. ^ Buono, S; Langellotti, AL; Martello, A; Rinna, F; Fogliano, V (August 2014). "Functional ingredients from microalgae". Food & Function. 5 (8): 1669–85. doi:10.1039/c4fo00125g. PMID 24957182. ^ McHenry, M. S.; Dixit, A; Vreeman, R. C. (2015). "A Systematic Review of Nutritional Supplementation in HIV-Infected Children in Resource-Limited Settings". Journal of the International Association of Providers of AIDS Care (JIAPAC). 14 (4): 313–23. doi:10.1177/2325957414539044. PMID 24943654. ^ Grobler, L; Siegfried, N; Visser, ME; Mahlungulu, SS; Volmink, J (2013). "Nutritional interventions for reducing morbidity and mortality in people with HIV". Cochrane Database of Systematic Reviews (2): CD004536. doi:10.1002/14651858.CD004536.pub3. PMID 23450554. ^ "What the United Nations says about Spirulina" (PDF). Spirulina and the Millennium Development Goals. Intergovernmental Institution for the use of Micro-algae Spirulina Against Malnutrition. December 2010. Retrieved 2 July 2014. ^ "Charter" (PDF). Intergovernmental Institution for the use of Micro-algae Spirulina Against Malnutrition. 5 March 2003. Retrieved 2 July 2014. ^ Characterization of Spirulina biomass for CELSS diet potential. Normal, Al. : Alabama A&M University, 1988.